The indoor/outdoor swim-under pool lets the outdoor enthusiasts among you show their true colors. The self-proclaimed "Whistler's best patio"
Make a date with that book you've been trying to finish, and find a seat in the airy, modern-mountain-style lobby. Sleek alpine-chic suites all have inviting, open plan living spaces. Carve out an hour in your not-too-busy vacation schedule and hit the gym. Make sure the little ones have their lift tickets attached and head for the Whistler Village Gondola Lift, just steps away. No waiting for the car to warm up, this resort offers ski-in/ski out access. Experience the fun and excitement of downtown Whistler, just an 8 minute walk from the resort. The beautiful mountain views at the resort provide the perfect backdrop for your romantic getaway or destination wedding. Visit Avello Spa for a hydrotherapy treatment, Hot Rock massage, manicure or a Skin Ceuticals facial. Recover from your day with a soak in the resorts' indoor or outdoor hot tub. Get your daily steps in at Blackcomb Trail, a 7 minute drive from the resort. Grab your clubs and go, it's a 4 minute walk to Whistler Golf Club Driving Range. Named the #1 ski resort hotel in North America (twice!) by Condé Nast, the Westin Resort & Spa is in the heart of the cobblestone, pedestrian-only ski village. It’s a quick 50-yard walk to the lifts at Skiers Plaza, giving you easy access to both mountains. A courtesy shuttle whisks guests between Creekside and Alpine areas, and the ski valet brilliantly doubles as golf and bike valet, depending on the season. (Pro tip: ski/snowboard valet services are on the house if you rent through Whistler Blackcomb.) For the serious go-getters, the WestinWORKOUT Fitness Studio beckons, complete with cardio machines and weights. Or grab one of the local running route maps designed and certified by New Balance and get your run in outside. Save an afternoon (or three) for the Avello Spa, one of Canada’s most comprehensive, with over 75 face and body treatments – and luxe touches like Japanese-designed, Italian-made Dodo chairs in the pedicure area, and imported Bouvier tubs and Vichy showers for hydrotherapy. Dining is a main event in most ski towns, and Whistler is no exception. Feast on modern interpretations of classic backyard favorites, dreamed up by the Vancouver-born and raised executive chef at Grill & Vine. The Summer BBQ Series is a smash hit, hosted every Saturday on Whistler’s most spectacular patio. Beautifully appointed studio and one- and two-bedroom vacation suites include pet-friendly perks like the Heavenly Dog Bed (to keep Fido from jealously eyeing your Heavenly human-scale version). And the kitchen is enough to inspire even non-cooks, with a Thermador stovetop, Sub-Zero fridge and plenty of space to hide the good stuff like the pro snack-stasher you are (years of practice). The soaker tub and gas fireplace are critical pieces to your post-skiing/hiking/biking recovery puzzle. And your private balcony or patio comes in handy more days than you might think. “Warm enough” is all relative, right? 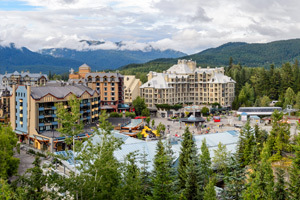 Host resort for the 2010 Winter Olympic Games, Whistler Blackcomb is a snow-sport mecca, with each day on the slopes capped off with a vibrant village après scene that actually continues all year round. Sunday nights, a massive crowd gathers to watch the free Fire & Ice Show at the base by the gondolas, where the best local skiers and riders flip their way through an impressive series of jumps – capped off with a grand finale fireworks show. Summer is equally amazing with bungee jumping, hiking, fishing, five local lakes – and rides on the record-breaking Peak 2 Peak 360 Experience. You can even take a guided tour to see the local black bears and cubs in their feeding sites and dens. Traveling with a crew of golfers? Line up tee times on all four championship courses, each by one of the world’s top designers: Big Sky by Robert Cupp, Fairmont Chateau by Robert Trent Jones Jr., Nicklaus North by Jack Nicklaus and Whistler Golf Club by Arnold Palmer.